The next morning, we hopped on a bus and headed up toward the most active of Mount Aso‘s craters. We were dropped off at the bottom of a rope way, from where we could either walk the rest of the way to the crater or pay 1000 yen for a roundtrip ticket and ride up. I’m sure you can guess which option we chose and before you decide to write us off as lazy, keep reading. Once at the top, we walked as close to the crater as we were allowed and tried to look inside, but it was difficult with the smoke billowing out. The barren landscape surrounding the crater was dotted with concrete bunkers and walkways heading up to the various peaks around us. Apparently the bunkers were built after a dozen people died in a small eruption 50 or so years ago and are meant to protect visitors in case of another. I can’t imagine feeling all that safe sitting in one of those things with a volcano erupting a hundred meters away and lava flowing all around. Would you feel safe waiting out an eruption in those bunkers? How about in these older ones? We might have liked to walk around the area a bit, but before we could even discuss that, the wind shifted and everyone had to retreat back down the cable car. It seems some of the gases rising out of the crater are pretty toxic and no one is allowed in the area when the wind blows a certain direction. Naturally, it started blowing that direction immediately after we arrived. Our brief view of the crater before we had to scramble back down. The crater on a better day. Photo by Igor Berger. We weren’t really all that disappointed, though, since the view wasn’t that great up there anyway. In fact, we noticed much better views at the bottom of the rope way. Just across the street from the cable car station, a green meadow stretched out to a distant peak. A small lake broke up the green with a spot of blue and grazing horses dotted the landscape. Directly across the road from us and the station, tourists could hop on a horse and ride it in a little loop around the meadow. Back on our side of the road, street vendors with large grills were serving up fresh horse meat. Perhaps this was an incentive for the horses on the meadow to keep those tourists on their backs happy. We didn’t bother with the horses; none of us felt like riding or eating one. Instead, we decided to follow a ridge-line up to the peak of the little mountain behind the meadow. It didn’t seem all that high and we figured we could get there fairly quickly. Sure enough, after hiking for an hour or so, we could see the peak just ahead of us. Excited to arrive, we quickened our pace and soon reached the top. Only it wasn’t the top, but simply the point where the next non-peak became visible. That’s the peak we climbed and the ridge-line we followed on the right. And so we climbed from one fake peak to the next until we’d seemingly conquered a whole mountain range and I was beginning to expect the next peak to have a cover of snow and a few peaks after that to be Mount Everest. It was at that point that we did finally reach the actual peak. Since we were in Japan, everyone wanted to take pictures of us in front of the sign with the name and altitude of the mountain we had conquered (I won’t write the actual altitude so that I can continue to use the word conquered), so I didn’t even get my customary 30 minutes of recovery time lying motionless in the dirt. After the required group photos, we took some more of the surrounding landscape and just generally enjoyed the views. Eventually, it began to sink in that we were going to have to walk all the way back down. Us and some dragonflies at the peak. I think I collapsed the second the shutter closed. The thought of heading back down over the 150 or so fake peaks along the ridge-line was too depressing, so we simply said ‘screw it’ and decided to plunge straight down the side of the mountain. It was obvious we would get to the bottom much faster that way. What wasn’t obvious was just how steep it was. We basically ended up slipping, sliding and often actually falling down the hill, while grabbing onto every bush, tree and branch we could to stop us from tumbling all the way to the bottom. The whole descent was a series of one to three meter drops that ended abruptly when we hit a tree or bush, with a bunch of complaining in between. By the time we got to the bottom we were exhausted and filthy and we still had to cross the meadow, although we did enjoy taking actual steps instead of dropping a few meters every time we tried to move forward. It doesn’t look all that steep from here, which is why we came up with the brilliant idea to walk straight down the front of that thing in the first place.. I can’t really remember doing anything after that, so I assume we just took the bus back to Aso town, got our stuff and hopped on the train back to Fukuoka. Either that or we did a whole bunch of stuff, but I blacked out from exhaustion and have no memory of it. I’m going with the first option. Either way, our trip to Aso—and my first overnight trip in Japan—had ended. It was my first experience with Japanese-style accommodation and while it might take some getting used to, I have relied on it almost exclusively since. It was also my first experience with a hot spring and while those might take some getting used to, I have avoided those entirely ever since. Combine the knowledge I gained concerning hot springs (never again!) and minshuku (great way to save money) with the beautiful scenery, the fresh mountain air and the cooler and less humid weather and our little weekend getaway was a huge success. 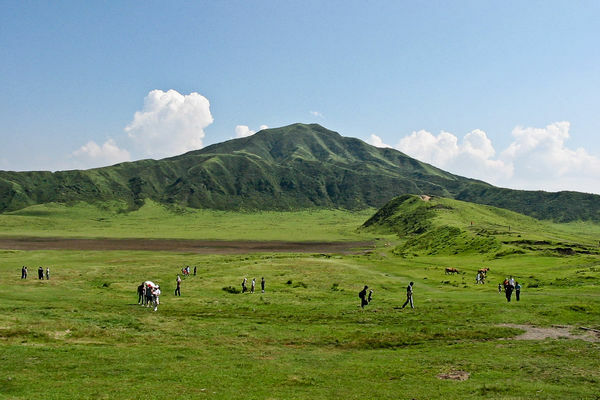 You’ll find practical information on visiting Mount Aso on this page. I can’t imagine the heat and smell that came up from that. People could use the word awesome, but somehow that doesn’t convey the full thing. Speechless perhaps, at first, then words later. A quick trip down, must’ve been fun. It mostly smelled like sulfur. At least before the wind changed. I have no idea what it smelled like after, but it’s probably better I didn’t find out. I was only in Japan for five days, and only got as far outside of Tokyo as Hakone. I’ll have to add this to my list for the next trip out there. I can’t resist a good volcano … or a long hike. I hope the winds will blow right for me. There’s definitely a lot of hiking to be done in the Aso caldera; we barely scratched the surface with out little trip up one of the peaks. I spent a year in Tokyo, but never made it to Hakone unfortunately. Daniel McBane recently contributed to world literature by posting..Why Couldn’t My Train Just Derail Like Everyone Else’s?